When we give tours in the Museum here at the Printing House, sighted people just can’t get their mind around the way you write with a traditional slate and stylus. Of course, because the downward writing stylus raises dots on the bottom of the paper, the braille characters must be written in reverse. Piece of cake for a six year old, whose brain is a ready and plastic sponge, but possibly more difficult for an older person learning braille for the first time. 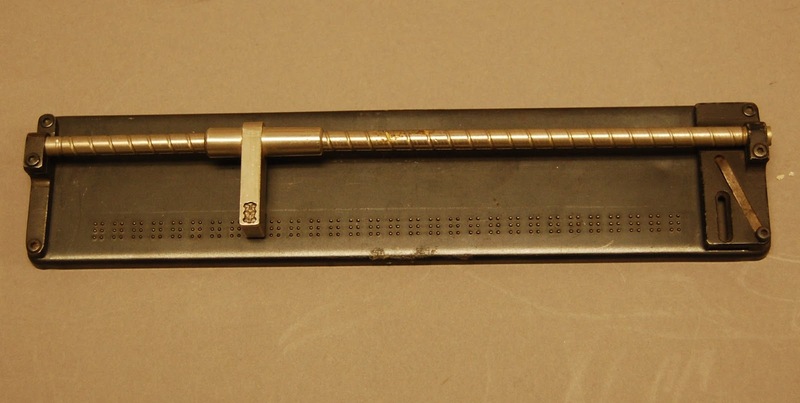 The challenge of designing a slate that would write braille left-to-right has intrigued many an engineer over the years. The Hoff Aid was an upward-writing slate designed primarily for use in making mathematical calculations on paper. It also permitted examination of your work without having to remove the paper from the slate. 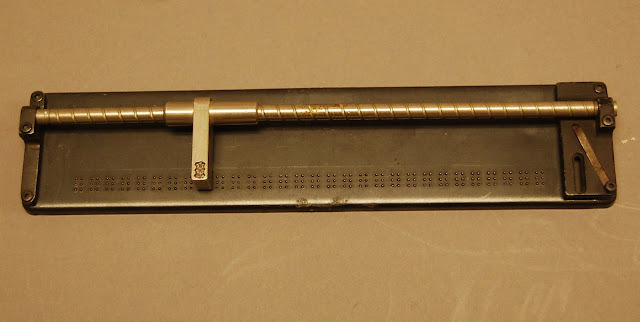 Paul Hoff, a teacher at the Minnesota Braille and Sight Saving School, filed a patent application for his aid in 1946, seeing it as a compromise between the light weight and portability of a pocket slate, and the right-to-left upward writing capability of the braillewriter. It was introduced in the APH catalog in 1955, and discontinued in 1973 after a total production of 538 units. In the end it was determined to be too expensive ($35 in 1972) when compared to a traditional slate ($2.50), and too slow when compared to other math tools such an abacus. It was operated by pushing buttons on the die box with a traditional stylus, which depressed a rod with a hollow tip over raised dots on the slate’s base. The die box was mounted on a grooved rod to allow it to advance one space as each character was formed.